A local marketing adventure is waiting to unfold – with you as the hero! Ready to unlock the power of Local Marketing Automation to boost local marketing efficiency and drive traffic to your locations? 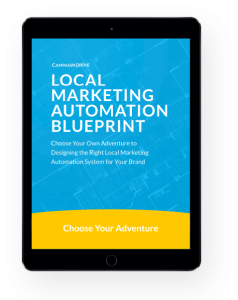 In the Local Marketing Automation Blueprint, you’ll learn how to implement a Local Marketing Automation solution that meets the unique demands of your enterprise brand and makes you look like a hero. In many ways, brand managers are like the heroes found in our favorite magical tales. But instead of slaying dragons or saving the inter-galactic sector, brand managers are tasked with marketing challenges that might make those storybook heroes quiver. With this blueprint, you’ll have access to convenient and easy-to-use strategies to initiate and manage a Local Marketing Automation solution that supports the unique shape of your enterprise. Choose your adventure and we’ll guide you to the best possible solution for your brand. This blueprint will help you forge your path towards marketing success!